This Banana Pudding recipe requires a 9x13-inch baking dish and, therefore, will bring satisfaction and happiness to more people. Make this and take it to a potluck or cook-out. You'll be a star! If you've been lucky enough to enjoy our original recipe for Grandma's Banana Pudding, rest assured that this recipe is identical except for the ingredient proportions. Line the bottom of a 9" x 13" baking dish with a layer of vanilla wafers. This recipe will use most of the box, so don't get carried away with snacking. Peel the bananas and slice into 3/8-inch rounds; use a ruler (I'm kidding). Cover the banana slices with plastic wrap to keep them from darkening and quickly make your pudding. Do not turn on heat yet. In a heavy saucepan, beat the egg yolks well (just use a fork or whisk, but beat them well). Add the milk and vanilla extract. Gradually whisk the sugar/flour mixture into the pan, mixing well and continuing to mash any flour lumps against the side of the pan with the back of a spoon (at this point, I recommend the use of a medium-handled wooden spoon). Put the pan on a burner over medium heat. Stirring constantly, bring the mixture to a gentle boil and, when the mixture begins to thicken, add the butter, continuing to stir. There is a point right about here where lumps keep forming no matter how hard you are stirring, but do not despair. Just keep boiling and stirring until mixture reaches a nice, smooth, rather thick pudding consistency. [Note: If you're working with an electric cooktop, adjust the heat so that it's hot enough to boil, but not so hot that the pudding scorches.] Remove from heat. Pour, spreading as necessary, half of the pudding over the banana layer in the 9x13-inch dish. Put down another layer of vanilla wafers, another layer of banana slices, and cover with the remaining pudding. 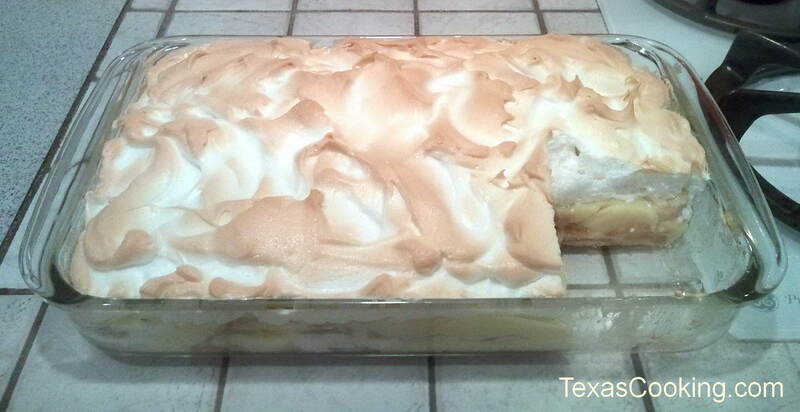 Bake in a preheated 375°F oven until meringue browns, 12 to 15 minutes, depending upon your oven. Keep an eye on it.